Asias flagship security expo SECON will come back to South Korea, 6~8 March, 2013. SEOUL, South Korea -- SECON 2013 (International Security Conference & Exhibition 2013) (http://www.seconexpo.com) has opened its online registration. Visitors who pre-register at the SECON 2013 website can attend the event for free. The pre-registration ends on February 28, 2013. SECON 2013 is sponsored by three Korean ministries -- the Ministry of Knowledge Economy, the Ministry of Public Administration and Security and the Ministry of Land, Transport and Maritime Affairs. It is co-organized by influential security media and associations in South Korea including SecurityWorld Magazine and Boannews Daily, Korea Defense Industry Trade Support Center, Korea Electronics Technology Institute, Electronics and Telecommunications Research Institute, the Korean Association for Industrial Technology Security, Intelligent Transport System of Korea, Knowledge Information Security Industry Association, Korea Association of Chief Security Officer, Korea Digital CCTV Research Association, Korea Safety Security Association of Technology Education, Korean Institute of Security, ASIS International (Seoul Branch), Korea Corporate Security Managers Council, Korea CCTV Industry Association. and Korean Police Studies Association. Exhibitors at SECON 2013 will present their latest technology innovations in Video Surveillance, Access Control, Biometric Recognition, Alarm Monitoring as well as Homeland Security, Risk Management, Intelligent Transportation and IT security. SECON 2013 will bring manufacturers, dealers & installers, system integrators, and corporate end-users of security products and services from across the globe together to learn, evaluate, and competitively source in a highly productive environment. Concurrent with SECON 2013, "Industrial Technology Security Fair" will examine the recent cases of industrial technology leak and the latest developments in countermeasures. "Security Education Seminar" will look at the current status of international security information exchange. "Seminar for Police Activities and Scientific Technology" will delve into directions for criminal investigation and use of latest technology. With participation by diverse security players from key Asian countries and its location based in South Korea famous for high-tech innovation, skilled workforce and business-friendly infrastructure, SECON has been recognized as the most preferred destination for security companies looking to increase their presence and expand their business in Asia. SECON 2013 will be held from March 6~8, 2013, at the Korea International Exhibition Center (KINTEX), South Korea. For more information about Asias flagship security expo SECON 2013, please visit http://www.seconexpo.com. - March 2013 will be the month when buyers from the Korean government will be out looking for security products and vendors for the large-scale public projects scheduled for the second half of 2013. 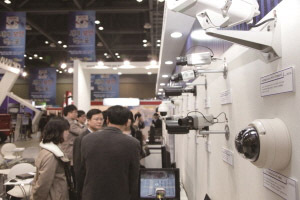 - Backed by the 3 Korean government ministries, SECON Exhibition & Conference 2013 attracts qualified security buyers at the Korean government, public corporations, private corporations that are conducting LARGE-SCALE security projects. - SECON EXPO 2013 provides the best way to find agencies and distributors in Korea because it’s the nation’s largest event of its type in Korea. - SECON EXPO 2013 is the ideal venue to learn about the latest trends in security technology due to its location based in South Korea famous for high-tech innovation. For more information, please send your e-mails to swied@infothe.com. ⓒ2011 www.securityworldmag.com All rights reserved.